This gig will go down in history as one of my favourites, ever. Two of my favourite bands playing together in one of Leeds' finest venues- what more could I possibly ask for? 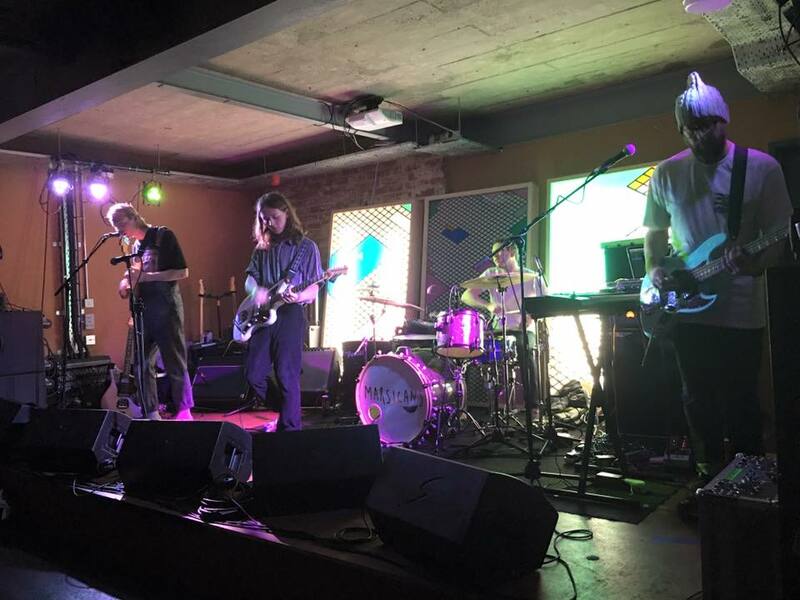 A few minor technical difficulties didn't stop first band of the night, new Bradford based band Glass Mountain, from owning the stage and proving themselves as ones to watch at this- their first ever gig. Playing before 2 such well loved local bands may have been a daunting prospect for the newcomers but if they were nervous then you couldn't tell. Enthralling from start to finish, the band remained cool and confident throughout, ending their set with impressive debut single Glacial, a whirlwind of musical brilliance which left me in no doubt that these guys are destined for an incredibly successful future. I feel somewhat honoured that I got to witness their live debut, and after checking out the recorded version on Soundcloud the next day I'm dying to see them live again. You can listen to Glacial here. I'm ashamed to say it's been almost a year since I last saw Carnabells live but the only good thing about there being such a huge gap is that I was really able to notice how much they've changed- and that's not just the line up! It's clear to see the effort that's gone into improving their live show. Carnabells are Luke and Mitch Thompson, Jack Mattison, Nathan Francey, and Mitchell Wright. Luke has really come into his own as frontman, and new drummer Mitchell Wright is phenomenal, perhaps one of the finest drummers I've ever seen. The new songs are a step away from their old material, but that's not necessarily a bad thing. The band are clearly growing and developing their own style, experimenting with a different look and an edgier, more pop orientated sound. Opening number We Found Freedom is hard hitting from the start and probably my favourite. Then came Catching Fire; released last August, this was the track that really heralded a new direction for Carnabells. It really shows off Lukes' instantly recognisable vocals. New single The Belle of the Strutters Ball is well received. I've had this one on repeat for a couple of weeks now so it was great to finally hear it live. Next comes an updated version of old favourite Station Road, which surprised me a lot as its been given a pretty big revamp. However, it still managed to remind me of the Carnabells I fell in love with a few years ago when I discovered them at Crooked Ways Festival in Pontefract. Carnabells are special, that's all there is to it. I realised this the first time I ever saw them live, and I can't wait to catch them again at Live At Leeds in a couple of weeks where they'll play Leeds University Stylus alongside acts such as Los Campesinos! & We Are Scientists. Pretty impressive. And then there's Marsicans... what can I say? There's something about this band that always puts a smile on my face. Quirky with infectious amounts of cheer, their personalities are reflected perfectly in their music and I always walk away from their shows feeling happy and excited to see them again. They're energetic, charismatic performers and that said, they're probably four of the nicest people I've ever met. Soon after doors opened I spoke briefly with Rob, who asked me if I was excited; naturally I said yes, and his response was a huge grin and "I bet you're not as excited as I am!" These guys have so much enthusiasm and it's so refreshing to see. Their set was the perfect mixture of old and new music; the crowd excitedly sung along to the likes of Gone In A Second, latest single Arms of Another, and closing number Chivalry. An unexpected but scarily good Whitney Houston cover was followed by forthcoming single Swimming. It's chipper and fun- Marsicans at their best, and undoutedly a suitable Summer anthem. I've never seen a band so well gelled and harmonised, and its all so effortless too- like they're not even trying. Now that's talent.